To follow the mini triumph of the Guy Lyons copy, Atlas quickly sent their rendition of a 434 TK crash truck. Since we had two Octopus, I suppose it makes sense that we get another Bedford. If they can get the typeface right, I could probably stand for a TK Castrol too. Here again the reproduction is very close. There is more curvature in the top edge of the windscreen, but otherwise just about a match. The box is outsize to include a couple of plastic packing pieces. Actually I'm using one of my very own repro boxes to make a comparison here, but I promise mine is the right size. Also Altas had difficulty again in copying the subtleties of the old image which they've redrawn or overdrawn to make it reprintable. Here is my TK Crash Truck, light green interior and dark green wheels. Price 7/11. That's a nice one Pat. Now you need a coal/castrol/cola/dropside to complement it! I notice that Atlas are treading the path of casting recycling with the issue of cab or back combos - two otter, two foden, two bedford, two vixen. This week an Isobloc arrived, which bodes a move into french dinky territory with this supertoys subscription. I expect they will start to send Berliet trucks and various buses as the months progress. Some of their french reissues have been very elaborate models - thinking of the circus set particularly - so it will be interesting to see if that turns up. Well I had the Top Rank, the coal lorry and the dustbin lorry with solid green cab from new. 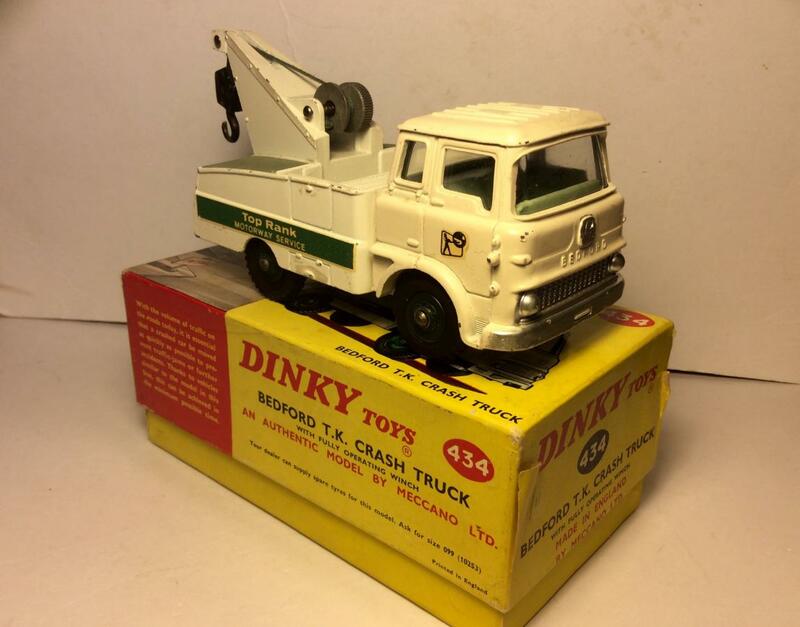 Never really liked these later Dinky trucks and the coal lorry went a long time ago as the sacks and scales had no chains to stop them falling off! Still have the dustbin truck with its little bins. I bought the yellow tipper recently mint boxed for £45 but it soon found its way on to eBay, closely followed by the Atlas orange one. I kept the Top Rank as I was given a red 589 with the same base back in the day and kept them as a pair, now joined by the Atlas Autoroutes version.